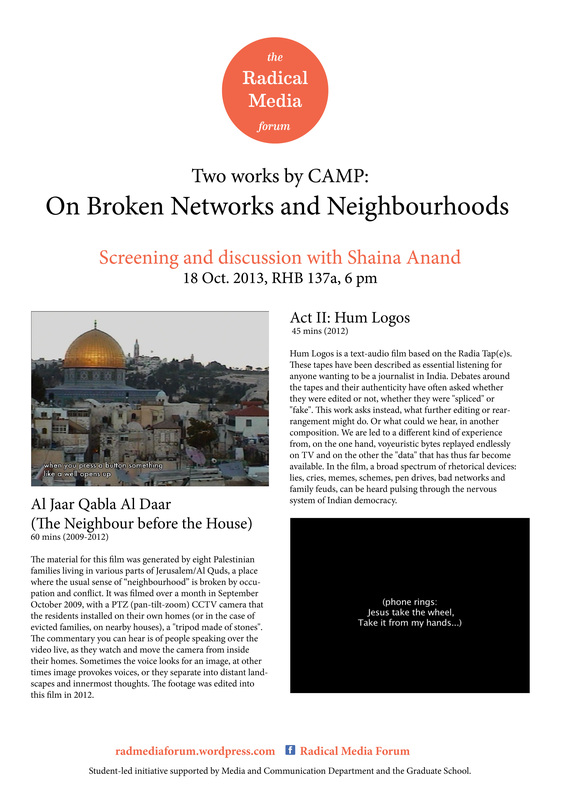 The material for this film was generated by eight Palestinian families living in various parts of Jerusalem/Al Quds, a place where the usual sense of “neighbourhood” is broken by occupation and conflict. It was filmed over a month in September October 2009, with a PTZ (pan-tilt-zoom) CCTV camera that the residents installed on their own homes (or in the case of evicted families, on nearby houses), a “tripod made of stones”. The commentary you can hear is of people speaking over the video live, as they watch and move the camera from inside their homes. Sometimes the voice looks for an image, at other times image provokes voices, or they separate into distant landscapes and innermost thoughts. The footage was edited into this film in 2012. Hum Logos is a text-audio film based on the Radia Tap(e)s. These tapes have been described as essential listening for anyone wanting to be a journalist in India. Debates around the tapes and their authenticity have often asked whether they were edited or not, whether they were “spliced” or “fake”. This work asks instead, what further editing or rearrangement might do. Or what could we hear, in another composition. We are led to a different kind of experience from, on the one hand, voyeuristic bytes replayed endlessly on TV and on the other the “data” that has thus far become available. In the film, a broad spectrum of rhetorical devices: lies, cries, memes, schemes, pen drives, bad networks and family feuds, can be heard pulsing through the nervous system of Indian democracy.